Sport utility vehicles are a dime a dozen these days, but it seems as if utility is found more universally in the niche than is sportiness. Nothing wrong with that, of course; flexibility of use is one of the things that make SUV's and/or crossovers so great, and so popular. But what if you want as much sport in your sport ute as you do ute? That narrows the list somewhat and may help lead to a perception that these "tall cars" are anything but sporty – and that they may even be prone to rolling if you try inflicting some enthusiastic driving on them. This is poppycock, of course. There's a new Porsche SUV and an upgraded version of the Boxster roadster in town, and both of them are about as great a value as one could hope for from the German maker of premium vehicles. Porsche's first SUV, the Cayenne, caused a wee bit of controversy when it was announced a decade and more ago. Porsche has now filled another non-traditional market niche for it – the small SUV – with the new Macan and if you like the Cayenne but found it a tad big for your lifestyle you'll probably love the Macan. The words "Porsche" and "fuel efficiency" may not be the closest of kissing cousins in many peoples' minds, especially when you're talking about a big, four door sports sedan. You may be surprised, however, to find that you can get better gas mileage with the Panamera e-hybrid than with many smaller, supposedly more efficient gas-only cars. It may have a downsized engine this year, but the 2014 Porsche Panamera 4S is still one heckuva car, a GT cruiser par excellence. What has 550 horses, even more torque, and seats five? Very few vehicles indeed - but the Porsche Cayenne Turbo S is one of them, and it's a real peach! This top-of-the-line version of Porsche's popular SUV is an incredible vehicle - as it should be based on its starting price of $166,600 Canadian. That's a wad of cash, indeed, but it'll buy you one of the most interesting and rewarding SUV/Crossover vehicles you can find. Porsche's 911 is definitely iconic, and a classic. And the new, 991 version of the 50 year old beauty is a wonderful car that's even more lust worthy than the previous generation. It's a car that has been refined over its half century of existence, from a tail happy death trap (well, that may be an overstatement) to a world class super coupe. I'd never driven a 911 before the last generation, so I missed all the supposed driving angst because Porsche seems to have worked out the bugs (pun intended; you could almost consider the rear engined 911 as the original VW Beetle taken to the extreme). Many Porsche purists were perturbed when the German sports car maker announced it was jumping into the premium SUV field a decade or so ago. Imagine what they thought when Porsche announced it was unleashing a diesel! But announce diesels they did and, in typical Porsche fashion, they've pulled it off with aplomb. It may not have the cachet of the mighty 911, but Porsche's Boxster two seat ragtop is a definite joy to drive. And with its new set of clothes, new technology and features, it's an even more compelling vehicle than it was already. The new Boxster looks recognizable to anyone who's seen an old Boxster, and is such a great upgrade that it won its Canadian Car of the Year TestFest category ("Sports Car over $50,000") last fall, beating out such worthy contenders as the Mercedes-Benz SLK 55 AMG, Ford Shelby Mustang and Chevrolet Camaro ZL1. It may look like a hunchback when the roof is down, but Porsche's 911 Carrera Cabriolet is still an exquisite car worthy of the lustful glances it's sure to bring. And what better way is there to experience the new, convertible version of a great car than to get it during the depths of winter, when the days are short and one's breath is frosty? That's what happened to me. Thanks to the realities of the calendar and the number of other writers who also get seat time (damn them all! ), Porsche offered me my week in the new 911 – my favorite car in the world, at least in coupe form – when there was snow on the ground, ice in my heart and it was too darn cold for open top motoring. Porsche's Panamera has been controversial since its initial announcement, mostly because of its rear end styling and the fact that – like the Cayenne – it isn't a sports car, and for Porsche to make other than a sports car is heresy to some people. I can see that point of view, but on the other hand have yet to find a Porsche that isn't an outstanding driving experience Porsche – though I've only driven their mainstream inventory of the past few years. The sports cars are sublime, but the Cayenne SUV is still a blast – as well as being quite practical if you need a premium SUV thing in your life (and who doesn't?). Just as automatic transmissions keep sticking more speeds onto their units (you can get up to eight now), it appears that manual transmissions are also getting more, er, in gear. And one of the many interesting aspects of Porsche's redesign of its legendary sports car for 2012 is its move from offering a six speed manual to now unleashing the world's first seven speed stick. Take a luxurious and fast grand tourer, add a healthy dose of political correctness, and you may end up with the Porsche Panamera S hybrid, a fine motor vehicle in which the political pandering doesn't ruin the drive. I haven't driven every hybrid, but of the ones I have – except for a few exceptions such as the Honda CR-Z, Infiniti M and Porsche's own Cayenne hybrid – they mostly seem to eschew driving enjoyment in favor of passing gas, er gas pumps. The fact that such vehicles also have a premium tacked onto their sticker prices, making it problematic whether the gas savings will ever pay for themselves, makes me even more confused as to why anyone would want to buy one. Porsche Cayman R – Grrrrrrreat fun! Introducing the sports car whose name may have been inspired by Talk like a Pirate Day: the Porsche Cayman ARRRRRR! It's a Cayman – which is a good place to start – but lightened and tweaked for performance on the race track, which is great if that's what you want to do with your Cayman. It's been loved and lusted after but now it's like the wizened old guy on new year's eve, the old who's rung out to make way for the bouncing baby new year that's rung in. Maybe that isn't the best analogy because, while the 2012 Porsche 911 Carrera 4 may be getting a bit long in the tooth in car years (like dog years but, at least in Porsche's case, far more expensive! ), it's still a fantastic car – wonderful to drive and undoubtedly terrific to own. Now, however, the venerable 997 edition of Porsche's famous sports car is on its way to the auto museum, replaced by a supposedly all-new version – the 991 – that from early reviews seems to be an excellent upgrade. I can't wait to try it! Has Porsche blinked? The maker of high quality sporting machines is introducing Hybrid versions of two of its vehicles, and is apparently taking orders for its 918 Spyder Hybrid supercar. What's going on? Has Porsche gone politically correct? Just in time to be replaced by a brand new Porsche 911 Carrera for 2012, the 2011 Carrera GTS is an upgraded and tweaked version of the 911 S for those who want just a bit more out of their classic Porsche sports car. As far as power delivery is concerned, the upgrade from S to GTS isn't huge, but who can argue against a Porsche offering extra horses? In this case, the GTS' 3.8 liter flat six engine (rear mounted, as are all 911s') cranks out a healthy 408 horses at 7300 rpm, an increase of 23 over the garden variety S. Porsche says the Cabriolet version reaches 60 mph from a standing start in 4.6 seconds (.2 seconds slower than the coupe GTS but .1 seconds quicker than the 911 S cabrio). Porsche 911 Turbo S – S-pectacular! If you're coming out of a winter that lasted far too long and Porsche is silly enough to offer you a week in its fabulous 2011 911 Turbo S, it might be understandable if your first thought is "Road trip!" It's easy to forget that Porsche's Cayenne and Panamera don't only offer delicious, powerful V8's, that they can also be equipped with a V6 engine that eases both the entry price and the price at the pump. Driving a Porsche 911 is like having nary a "Carrera" in the world. Or something like that. Creating Porsche's first four door sports car was a gutsy move that risked alienating customers, millions of development dollars, and the company's reputation. It isn't the first time Porsche has done this, of course. The Cayenne SUV may have sparked even more spittle when the company first announced it – and it's now a respected vehicle that sells well – and with good reason. Sports cars are a blast during good weather, and it might surprise you to learn they can even be a hoot after Old Person Winter has come a-calling. How can you have a real sports car without a manual transmission? There's a revolution brewing personified by new generations of automatic transmissions that offer so much efficiency and, yes, driving enjoyment that you can almost forgive the fact that your left foot might atrophy from lack of use. Porsche continues to tweak its lineup, making it sportier all the time. To illustrate this, they've added a GTS version to the Cayenne, and a new "automatic" transmission that's anything but shiftless. Can a lowly V6 propel a 4800 pound Porsche to the kind of blistering speeds for which the company's vehicles are known? Or is it more a way to save some bucks and gas while still getting the Porsche cachet? Shiftless? Porsche Creates a 911 Just For You! Few would argue that Porsche's 911 Carrera is a classic. For more than forty years it has been a benchmark sports car, a seemingly timeless style that, thanks to constant refinement and updating, still inspires lust. It's clearly a car that has never been passed by the sands of time or the rigors of fierce competition. That's a remarkable achievement, especially in a time when technical innovations come so quickly it can make your head spin. How do you make a terrific sports car even more terrific? What would you do if you had 550 horses at your beck and call? Who would have thought that painting a car brown would cause it to become an object of lust? This is open top motoring as it should be – like driving an MGB of days gone by, but with a little more room, a little more luxury – and a lot more performance. Boxsters, unlike B's, also run in the rain and don't require a college degree to get the roof up when the clouds burst. They're big, brawny and luxurious – and can go nearly anywhere. But are they any good? Well of course they are – this is high end stuff! Do you lust after the legendary Porsche, but find the Carrera Turbo just a little too, well, stratospheric? Take heart! Even the more "down to earth" Porsches are still an absolute blast, as evidenced by a couple of weeks I spent with the "entry level" Carrera and the "upscale" entry level model, the Boxster S.
Porsche Targa 4S- World's Greatest Sunroof! Porsche 911 Turbo - Can you say "Whoosh!"? Porsche Cayman - a "Low End" Supercar? There's nothing quite like a Porsche, at least in my experience driving and writing about driving. Porsches speak on a visceral level; the current 911 Carrera is the most gorgeous in the car's long history of being gorgeous, and driving one is even better than looking at one. There were howls from some quarters when Porsche announced an evil SUV. Could humanity survive? It has so far! 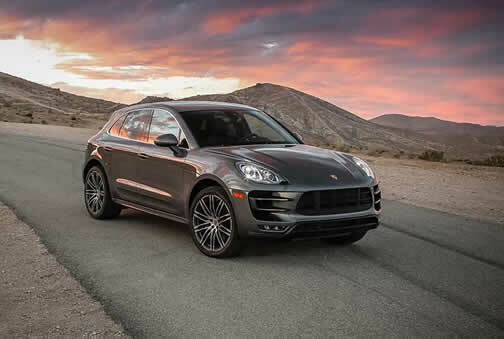 The Cayenne features permanent four-wheel drive, four-wheel independent suspension, stability and traction control and the ability to tow 7,716 pounds. The Titanium Metallic Cayenne S of my test is the "second lowest" model of the Cayenne, which is kind of like saying a Mercedes S class is a stripped down Maybach. "A body designed to seduce. An engine tuned to excite. Performance engineered to reward." That's how Porsche's website describes the Cayman S, the German company's "entry level" sports coupe, and if one is ever going to start believing marketing hype this is a pretty good place to start. There's nothing quite like the combination of a warm day and an open top sports car to put a smile on your face. Porsche Boxster S - "S" is for "Sweet!" Ah, Porsche, the legendary marque with the glorious racing heritage. High end performance stuff, this, even at what could laughingly be called its entry level. That entry level would be the Boxster currently, the mid-engined, two seat open top roadster that's guaranteed to bring a smile to the face of any car buff. For a base price of a mere $45,000, you can strap yourself into this road rocket and be treated to zero to 60 in under six seconds from its 240 horsepower, 2.7 liter flat six. And if that isn't enough for you, there's the Boxster S, the subject of this piece. It ups the ante in every way including, of course price. In this case, for a base price of $54,700, you get a 3.2 liter six that cranks out 280 horses @ 6200 rpm (and 236 ft.-lb. of torque @ rpm 4,700 rpm), decreases the zero-sixty time to 5.2 seconds and increases the top speed by eight miles per hour to an awe-inspiring 167 mph. Porsche. Like the Maltese Falcon, it’s the stuff that dreams are made of. People fantasize about Porsche, lust after Porsche. Me, too. I’ve always loved Porsche – from afar, alas – especially the classic 911 that in its latest incarnation is more gorgeous than ever, with lines so muscularly seductive and graceful it can bring a lump to the throat of the car nut. As a writer fairly new to covering the auto industry and working to build credibility in that niche (no laughing, please! ), when I was invited to take two versions of this automotive jewel for test sessions, wild horses (or even prancing ponies) couldn’t keep me away. So it was written and so it was done: I got to try the Carrera S hardtop and the Carrera Cabriolet convertible.